Last week I spoke about trying to love and accept myself for who I am and how I look. I made a promise to myself that I would not beat myself up for every little thing. I worked on this all week and I am happy to report a boost in my self-confidence. Unfortunately, I struggled with my nutrition and workouts. They were not perfect, but you know what? 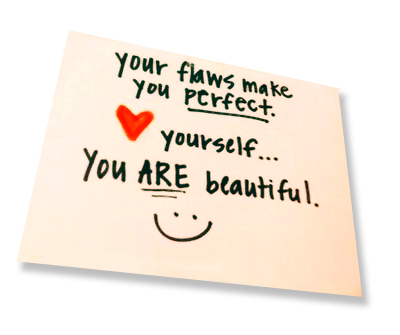 That’s OK…cause neither am I, and it’s those flaws that make me the person I am today. Perfect doesn’t exist, and the sooner we all come to terms with that, the happier we will all be. The above is this idea that so many of us strive for. We spend so much of our time and energy trying to achieve it that we miss the little things that make us who we truly are. It’s become obvious to me the final leg of this journey is purely mental. It’s all mind over matter and learning to respect, accept and love the person I am, where I have come from and where I am heading. All of these pieces need to fit together like a puzzle in order for me to truly accept myself. In the long run, accepting and loving myself is all that truly matters, because if I don’t, I can’t expect anyone else to.